INGRID JENSEN: Friends and family, the academic session has arrived. [MUSIC - EDWARD ELGAR, "POMP AND CIRCUMSTANCE"] Leading the procession is Ford Faculty Award Winner, Professor Bill Schmidt, followed by our PhD candidates, followed by the MBA and MPS class speakers and class representatives. These presenters are followed by the three MBA programs and the MPS program Accounting Specialization. Please congratulate and welcome the Class of 2018. Please rise and welcome the Johnson faculty led by Associate Dean Andrew Karolyi. Good afternoon. Welcome to the Johnson Graduate Recognition Ceremony in honor of the Class of 2018. Please be seated. We are going to begin with a little music from a Cornell a capella singing group. Please join me in welcoming After Eight. [APPLAUSE] [MUSIC - AFTER EIGHT, "LIFE IS A HIGHWAY"] (SINGING) Life's like the road you travel on, it's one day here and the next day gone. Sometimes you bend and sometimes you stand, sometimes you turn your back to the wind. There's a world outside every darkened door where blues won't haunt you anymore. Where the brave are free and the lovers soar, come ride with me to the distant shore. We won't hesitate to break the garden gate. There's not much time left today. Yeah. Life is a highway. I wanna ride it all night long. If you're going my way, I wanna drive it all night long. Through all these cities and all these towns, it's in my blood, and it's all around. I love you now like I loved you then. This is the road, and these are the hands. From Mozambique to those Memphis nights, the Khyber Pass to Vancouver's lights, you knock me down. I get up again. You're in my blood. I'm not a lonely man. There's no load I can't hold. A road so rough, this I know. I'll be there when the light comes in. Tell them we're survivors. Life is a highway. I wanna ride it all night long. If you're going my way, I wanna drive it all night long. There was a distance between you and I. A misunderstanding once, but now we look it in the eye. Again, congratulations to all of you graduating Class of 2018. Congratulations so very much. [APPLAUSE] (SINGING) There ain't no load that I can't hold, a road so rough, this I know. I'll be there when the light comes in. Tell them we're survivors. Life is a highway. I wanna ride it all night long. If you're going my way, I wanna drive it all night long. Life is a highway, I wanna ride it all night long. If you're going my way, I wanna drive it all night long. Life is a highway. [APPLAUSE] (SINGING) I wake at night and think I hear remembered chimes. And mem'ry brings in visions clear enchanted times. Beneath green elms with branches bowed, in springtime suns. Or touching elbows in a crowd of eager ones. Again, I'm hurrying past the tow'rs or with the teams. Or spending precious idling hours in golden dreams. Oh, Cornell, of the kindly heart, the friendly hand, my love burns clear for you in distant land! O fates that shapes the lives of men. Vouchsafe that I, before I die, may tread "The Hill" again. Oh, Cornell, of the kindly heart, the friendly hand, my love burns clear for you in distant land! O fates that shape the lives of men. Vouchsafe that I, before I die, may tread "The Hill" again. May tread "The Hill" again. [APPLAUSE] INGRID JENSEN: Thank you, After Eight. Before we begin the formal part of the program, I would like to introduce the people on stage with me who will be assisting in today's ceremony. To my left, our Associate Dean for MBA Programs, [INAUDIBLE] and Associate Dean for Cornell Tech, Doug Staymen. They will be congratulating the MBA students as they are recognized. To my right, our Associate Dean Andrew Karolyi who will perform the hooding of the PhD candidates, Professor Jack Little who will congratulate the MPS in Accounting Specializations students, and Senior Lecturer Barbara Mink who has the daunting task of reading each of our graduate's names today. It is now my great pleasure to introduce Dean Mark Nelson who will deliver the commencement address. Dean Nelson serves as the 12th Dean of the Samuel Curtis Johnson Graduate School of Management. An award winning accounting teacher and researcher, he assumed the Anne and Elmer Lindseth Deanship in 2016. Please join me in welcoming, Mark Nelson. [APPLAUSE] MARK NELSON: Thank you, Ingrid. How about After Eight, huh? How about another round of applause for them. That was wonderful. Members of the Class of 2018, families, friends, I am honored to welcome you to the Graduation Recognition Ceremony for the 71st graduating class of the Samuel Curtis Johnson Graduate School of Management at Cornell University. [APPLAUSE] This weekend we're awarding degrees to five PhD candidates. 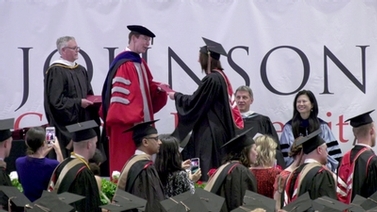 We also award MBAs to 62 candidates from the Johnson Cornell Tech MBA program. Can I hear, are any of you here? [CHEERING] We have 70 candidates from our accelerated MBA program. Are any of you here? [CHEERING] OK. Let me see. We have 19 candidates who will receive degrees from our inaugural class with a Master's of Professional Studies, MPS, with an emphasis in accounting. You guys have to make some noise. Are you here? [CHEERING] That was good. That was good. And last, but, of course, not least, we have 288 MBA candidates from our two year MBA program. Are you here? [CHEERING] What an amazing group of people. 19 of you today are actually completing two degrees. You're completing an MBA and another Cornell degree, such as law, engineering, real estate. Today, we celebrate your achievements and all that it took to get to this point. We celebrate you. I'd like to pause a moment, though, and recognize that few of us arrived here without the help of others. So candidates, let's show appreciation for those who provided support along the path to this achievement-- the family and friends who supported us in so many ways. [APPLAUSE] I'd also like to pause a moment and highlight the faculty and staff colleagues who are with us here today. It's their dedication, it's their inspiration, both inside and outside of the classroom that truly defines a Johnson degree. And we all know that an event like this does not occur without many people working behind the scenes in ways that we can only imagine. So please join me in thanking the faculty and staff for all they have done and continue to do to support you and to support Johnson. [APPLAUSE] OK. Enough about them. Let's talk about you. This is about you. I'd like to focus on two aspects that I think have defined your experience, your community, and your impact. And first, let me talk about community. Each person graduating here today is a member of their particular program. They're proud of that affiliation. They're fiercely dedicated to their fellow students. But you've also spanned those boundaries in many important ways. JCT and AMBA students share the summer cores together, both inside Sage, and occasionally they even would venture outside the classroom level to experience Ithaca in July. AMBA's MPS students and two-year MBAs share the elective curriculum throughout the fall and the spring semester. And I felt like they were particularly in their universal appreciation of Sage socials. MBAs from Ithaca and New York City have participated in our New York City curriculum options, including weekend courses and seven-week intensives that feature digital marketing, fintech, and the New York City nightlife. Together, you've experienced many, many firsts. You're the first students to use the Breazzano Family Center for Business Education here in Ithaca. You're the first students to study at Roosevelt Island. For two-year students, you're the first to conduct your MBA entirely as members of the SC Johnson College of Business. And, of course, our MPS accounting students are the first to graduate from that program, a program that could only exist by drawing together faculty and staff from across the SC Johnson College. You've supported each other in many, many ways. You've helped each other succeed in the classroom, both in formal TA and Leadership Fellow roles, but also informally in core teams and work groups. You've supported each other in the job search process, with practice interviews, with CWGs, and perhaps most importantly, with moral support. You've seen each other through the saddest of times. Our two-year MBA students suffered the death of a classmate, Jason Thomas, in their first semester at Johnson. That was a wrenching experience for this community. But in the midst of that tragedy, and led by our association of veterans, we saw the community draw together to remember Jason and support Jason's family and each other. Even at that very difficult time, I was so proud to see the strength and the support of this community. [APPLAUSE] And you've invested your time and your energy to make your communities stronger. At Cornell Tech, students helped to build a sweeping Code of Conduct, institutionalizing systems to create a respectful culture of accountability for the benefit of future classes across programs at Cornell Tech. In Ithaca, our Diversity Council worked with our Office of Diversity and Inclusion to include alliedship in our core, to conduct conversations on fiery topics, and to institute many other changes to enhance the inclusiveness and the climate of the Johnson community. More work remains to be done, but in part because of these efforts to date, I'm proud to announce that our incoming two-year class has increases in both the percent of women and percent of under-represented minorities. [APPLAUSE] Our one-year MBA and our Cornell Tech classes of 2019 both have 46% women students each, bot dramatic improvements. [APPLAUSE] Going to clap for that. And, in fact, Johnson has more women from our two-year AMBA and JCT classes attending the Forte Foundation Conference next month than does any other leading school. We work together to make that happen. And I'm very grateful. Thank you. [APPLAUSE] So that takes me to impact. You've obviously already made an impact at Johnson, leaving an indelible mark that will benefit future generations of students. You've started things that we will continue to work on, continue to develop. And again, I'm very grateful for that. But, moreover, you've also already worked together to apply your knowledge and to apply your creativity to make an impact on the business world and the greater world at large. A few examples. One Ithaca-based team of AMBA and two-year students undertook a project with a very large high tech company to identify the conditions needed to accelerate the adoption of virtual reality to consumers. They surveyed consumers. They interviewed various content and hardware suppliers. They evaluated the current state of adoption. And then they presented their final recommendation three times to the US team, then to the international tea, and, finally, to the Senior VP responsible for virtual reality and other technologies. They made a difference. As another example, a Cornell Tech team of computer science and MBA students sought to address the plight of the 800 million illiterate people worldwide who struggle to use smartphones. Their product, [INAUDIBLE] is a text-free, voice assisted, mobile OS solution enabling these people to use their smartphones to perform basic functions like communicating with each other and gaining access to useful content. That made a difference. And as another example, a group of strategic marketing immersion students worked with Boston Scientific which is pioneering an FDA approved therapy called spinal cord stimulation, or SCS, for treating patients suffering from certain types of chronic pain. While Boston Scientific started doing clinical trials of SCS devices at the Mayo Clinic, they invited Johnson's SMI students to study physicians' acceptance of this new treatment. And the students studied the drivers and barriers to market acceptance of this critical treatment for hypertension and presented recommendations to Boston Scientific on the future expansion opportunities that can enable this new therapy to be very, very effective. That was really important. I mean these are just a few examples among so many innovative ideas and products and technologies that you've brought to life during your time here. Many more will continue to develop and will flourish from beyond these walls. You already are producing much needed products and services. You already are making a positive impact on the world. Your future will indeed be remarkable. I'd also like to highlight another way in which you've already made an impact. Each generation of Johnson students benefits from those who came before. Think of the many ways in which alumni have helped you as admissions ambassadors, class speakers, mentors, and partners in the recruiting process. They also help Johnson financially in ways that benefit the school today and over time. And just as you have supported one another in Johnson in so many ways as students, you've also distinguished yourselves through contributions to Johnson's Annual Fund. Across the residential programs in attendance, we had an impressive participation rate of 92% and counting. And everyone in our community should be really grateful for all that you have done. So would everyone please join me in applauding the achievements, and the generosity, and the dedication of these wonderful students. [APPLAUSE] Now here's my ask. You knew it was coming. Whenever you let a dean speak, you know there's an ask. It's really pretty simple. Don't let up. Don't slow down. Don't stop doing what you've been doing. From a community standpoint, you're now part of a broader community. You're joining an alumni community of more than 15,000 Johnson graduates, almost 40,000 college graduates, and over 250,000 proud Cornellians, all bleeding Cornell red and all part of your extended family. You've probably heard me say that at Johnson, we do have each other's backs. And we propel each other forward. That applies to this broader alumni community as well. Countless alumni have told me how much the Johnson network has meant to them personally and professionally throughout their careers. So make the resolution to stay engaged with your class and with the school. Please attend at least one alumni event next year. That's a great start. And most importantly, just don't let yourself drift away from this community. Immerse yourself in it. Be there for your fellow alumni as you have in your degree program. My pledge to you is that we will be here for you as well. And from an impact standpoint, I don't have to encourage you to excel. I know you will. You have the knowledge, skills, energy, and network to make a real difference in the world. You've already demonstrated that. Your Johnson degree will help you on that journey. And you will honor that degree with all you achieve. I can't wait to see what amazing success awaits you. We are immensely proud of you. All in attendance, please help me congratulate the class of 2018. [APPLAUSE] Now at this point, I'm also pleased to present Johnson's Faculty Research Award. We present this award at graduation, because research is a crucial part of what we do at Johnson. And it is tied fundamentally to our teaching and, therefore, to our students. We differentiate our school by creating knowledge that impacts business practice and that gives our students an advantage in the marketplace. This year's winner of the Faculty Research Award is Professor Justin Johnson. [APPLAUSE] Let me tell you about Johnson. 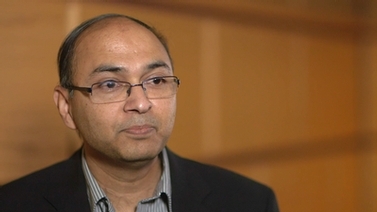 Professor Johnson is an active and globally renowned researcher in economics and strategy. He's currently an editor of the Journal of Industrial Economics, one of the top journals in his field. He uses analytic tools from economics and game theory to better understand how firms can succeed in challenging environments and to understand what strategies they can adopt to either achieve or maintain dominance in markets. Much of his research is motivated by events in high tech markets, such as work on open source software and work on the business and pricing strategies of web-based resellers of airline tickets, hotel rooms, and other products. More broadly, he is interested in markets where rapid change is taking place and in how firms can survive and thrive in the face of change. Many of you know Professor Johnson as a talented teacher of strategy, but he also serves as Area Coordinator for the Strategy and Business Economics Area across the SC Johnson College of Business. Please help me congratulate Professor Justin Johnson. [APPLAUSE] Justin, stand up. Yeah. There he is. Thank you. Thank you. INGRID JENSEN: Thank you, Dean Nelson. And congratulations, Professor Johnson. At this time, I would like to acknowledge the special awards and designations that are noted in your programs today. These include student awards that were presented at a brunch yesterday here on campus and last week at a ceremony on Roosevelt Island at the Cornell Tech campus, students receiving prestigious named scholarships and fellowships, and, finally, students who have served in a crucial role as class officers, class agents, as well as those who will be leading the Johnson Group in tomorrow's ceremony. You will see these honors printed in your programs. We offer these graduates our sincere congratulations on their many, many accomplishments. [APPLAUSE] It is now my pleasure to introduce your 2018 class speakers who will come to this stage at this time. James Groark for MPS in a Management Accounting Specialization, Ethan Green for the Cornell Tech MBA program, Ying Wu for the one-year Ithaca MBA program, and Amanda Archila for the two-year MBA program. [APPLAUSE] JAMES GROARK: Hello, friends, parents, guests, teachers, administrators, and, of course, our two world renowned accounting icons, Professor John McKinley and Professor Eric Lewis. On behalf of the Class of 2018, I would like to welcome you all to the Johnson Commencement Ceremony. Before I get started, there are two things that you should know. Number one, I'm a little sick today, so know that this speech is just as painful for me to give as it is for you all to sit through it. And number two, this speech sounded fine in my head, but like most other papers I've written in college, I wrote it the night before. So today is a huge, huge, huge honor. Now most traditional graduation addresses begin with something along the lines of as I look out into the crowd here I see future pioneers of technology, lawyers, doctors, and surgeons, people who are going to do great things in this world. Well, don't get your hopes up today, because this is a business school graduation. As I look out into the crowd here, I see real winners-- accountants, consultants, and I can't forget investment bankers. [LAUGHTER] While I wish I can impart wisdom to us all and tell us to be bold, pursue our passions, follow our dreams, and take risks, I know at the end of the day, we're all going to take that job at Goldman Sachs. So I'm going to keep this short, just like Galantis's performance at Slope Day, and just like a resume, all on one page. Our choice to attend Johnson has been one of the best decisions that we have ever made. And thank you to all who have helped and supported us along the way. Each one of us by attending a "top ranked" institution have been given opportunities that so many others will never have. We need to be grateful for these opportunities and be sure to not take them for granted. It's important to remember that with greater opportunity comes greater responsibility. And it is our responsibility to try and make this world a better place. I hope that after today, you can use what you've been given here-- a great education, strong values, and honorable ethics-- to give back to society, pay it forward, and do good for the world. We might not all be able to find a cure for cancer or bring about world peace, but we can be kind, understanding, and helpful individuals towards fellow human beings. At the end of the day, people will always remember us for who we were, not how much money we made. Graduating, while it is no small feat, is not our end goal. Let's pat ourselves on the back if we must, but know that we are just getting started and we have a lot more to accomplish. And as we go on to accomplish great things in our personal lives and in business, we must be sure to never forget where we came from-- the mean streets of Ithaca, New York. We can't forget all of our friends, peers, and teachers who always went out of their way to help us. After all, we hear it time and time again, the Johnson people-- its students, faculty, and staff-- are what makes Johnson stand out. We're a small community. And even Ithaca is far away from our homes, we are a family. Don't ever forget that. And most importantly, remember to never take anything too seriously. Always devote yourself to doing things well. But, be careful not to do them too well, because if you do, they'll force you to give a speech about it in front of thousands of people. Before I leave, I have to say a few words about the MPS Accounting Program. This was the first year of the program and I don't think we could have asked for a better group of people. And the man responsible for that was Director Jack Little. He had a great vision and he really did a fantastic job with the program. [APPLAUSE] To my classmates, you are all world class individuals and I hope to remain friends with each and every one of you for life. Honestly, there's so much I could say to you guys right now, but I think [INAUDIBLE] sure puts it best, "Be audit that you can be." Thank you. [APPLAUSE] ETHAN GREEN: Johnson faculty and staff, friends, family, and fellow Johnson graduates. My name is Ethan Green. And I have the honor of speaking on behalf of my fellow Johnson Cornell Tech MBA classmates. How did we get here? Business school is often cited as a major turning point in one's life and career. At major decision points like this, we stop and ask ourselves this question to help us understand where we are going next. How did we get here as MBAs? Cornell Tech was founded as a world class graduate education and research campus in New York City to prepare students for the digital age. And our graduating class exemplifies the diverse range of technology leadership and the vision the campus was designed to foster. Cornell Tech has already inaugurated its fifth MBA class. And the second class designated for Roosevelt Island is already well underway. The passage of time is vividly clear for us all. We arrived at Ithaca a year ago, seeking a world class business education, the opportunity to pioneer a new breed of technology graduate student, and a set of peers to take on the world with. It was not just a startup or educational entrepreneurial experiment, but an intrapreneurial venture. Over the past year, we shared in one another's successes and failures as we learned the credits and debits of accounting, consulted tech startups in Tel Aviv, and pitched in front of some of the top venture capitalists in New York City. While for some of us, our post-graduation plans revolve around the murky, unicorn filled world of startups, for others, leadership roles at prominent technology companies and disrupted industries await. Regardless of our next steps, the present moment is as sweet as the taste of Dean Dan's Big Apple Pecan Ice Cream, a Cornell dairy ice cream flavor innervation of Cornell Tech's own MBA students. We have arrived here through our own vision and work ethic following in the footsteps of Cornell founders, faculty, and alumni who built our university. As we leave this campus and join the professional world once more, the nature of business and society has never been more in question. How will technology change the notion of work? How can entrepreneurs and leaders foster diverse and inclusive companies and organizations? Who should lead these companies and governments and how? When faced with such uncertainties, it is easy to put our heads down, not question the status quo, and collect a paycheck while picking up where others left off. But as we learned in Disruptive Technologies class with Professor Donald Greenberg, business success will come to those companies who are aiming for five to 10 years from now, not just one or two years down the road. Simply put, we must transport ourselves into the future and ask our future selves how did we get here and work backwards. As Johnson alumni, it is our privilege to receive first-hand instruct in instruction from brilliant, ambitious faculty who help us to build the tools we need to answer this question. But building the future we have imagined is a privilege that every one of us assembled here today can share. And it's easy to forget the power we have when life gets busy stressful and overwhelming. As we gather today in celebration of our achievement, let's celebrate the experiences and friendships that we've enjoyed and commit to building that future, no matter what challenges we face. We will confidently answer the question of tomorrow the same way we answer the question of how did we get here today-- with great friends and family at our backs and determination to contribute to a bright and ethical future. Congratulations, Class of 2018, and to our friends, family, and fellow Johnson faculty and staff. [APPLAUSE] YING WU: Dear distinguished faculty, family, and fellow graduates. It is such a privilege for me to present the one-year MBA Class of 2018. Today as we gather here with all of you to celebrate our graduation, I would like to take a moment to look back at our MBA life at Johnson and reflect upon who we have become while looking forward to the path we have paved for ourselves. When I first came to Johnson, I knew that I wanted to rediscover myself both professionally and personally. At that time, I was experiencing a personal identity crisis. And I had my first child, a two-year-old son Albert-- up there-- while I was without a working menu. Then I left my job, my friends, and the good food in New York City. During my MBA journey, I would actually doubt myself, my goals, and even sometimes be questioned by other people. Luckily, here in Johnson, I had the support of my fellow students and classmates whether they had shared the same experience as me or not could put themselves into my shoes and imagine what I have been through. When I thought I would spend my birthday alone, and it was a busy time during summer core classes, the entire class coordinate and threw a surprise party for me. When I had the flu, porridge was made and delivered to me. These personal gestures mean so much to me that I also see these incredible sense of community, really caring through the professional perspective. From like collaboration in the core team to on working on the case competition, from prepping for interviews to sharing knowledge, I know it's redundant for me to share more since I know you all get these. My key takeaway here is within this community I truly feel empowered and supported which helped me remember why I am here-- to constantly challenge myself, and to learn and empathize, to work on and improve as a leader, and to continue to contribute, and to make my loved ones proud. Most importantly, my time at Johnson is a life-changing experience for me. Not only have I forged lifelong, friendship, but also I'm confident to call Johnson my family. Tomorrow, we will become Johnson MBA graduates with responsibilities to the community and to this world. No matter where we go and what roads we're going to take on. And here are the two attributes that we are all proud to take with us-- first, the passion for the Johnson value, and, second, the propensity towards action with underlying skills and experiences necessary to execute. I'm confident that we will be able to conceptualize and develop initiatives that promote Johnson value so that we can leverage our skills to continue to make an impact to our community and towards the Johnson family. Every story has an end. But in life, every end means a new beginning. At this very special moment, it is my honor to start a new beginning with all of you. We will remember our Johnson experience for life as I know that Johnson will also remember all of us, the Class of 2018, especially during the next giving campaigns. Congratulations, again Class of 2018. And in my native language [NON-ENGLISH SPEECH], thank you very much. [APPLAUSE] AMANDA ARCHILA: The Apple Award was established by the Class of 1992 as part of its class gift. This award allows graduating classes to honor a faculty member who they believe demonstrates the qualities of outstanding leadership and enduring educational influence. Each year the recipient is presented with a crystal apple in recognition of his or her dedication and ability to motivate students toward academic achievement. This year's Apple Award winner is recognized for not only making his subject relevant and engaging, but for displaying an exceptionally high level of commitment to his students and the school's success. As a former student and tutor in his course, I saw firsthand the warmth he brought into the classroom, the challenging material that he was able to translate into tangible and urgently needed tools for success in business, and perhaps most importantly, his openness to serve not only as a professor, but as an advocate and an ally for all students at Johnson. YING WU: And here are some words from a few of his other students in the class. "Your focus, dedication, and insights into the real world were one of the highlights of my time at Johnston. Thank you so much for always being available to your students, you really speak volumes to your character and intent. Please keep making data analytics fun, interesting, and applicable for the future class of Johnson students. Without a doubt, your class had an enormous impact on my internship results. At Johnson, we talk all the four Cs-- competence, character, compassion, courage. Every day, in ways big or small, you steadfastly live out these values. Thank you for manifesting the highest ideals of this institution both through your words as well as your deeds." An Assistant Professor of Operations Technology and Information Management at Johnson, he teaches data analytics and modeling in a residential two-year MBA core curriculum. On behalf of the Johnson community, it is our honor to present this year's Apple Teaching Award to Professor Bill Schmidt. [APPLAUSE] WILLIAM SCHMIDT: I am incredibly humbled that the Class of 2018 has honored me with this recognition. Thank you. But let's cut to the chase, because today is not about me or any of the faculty or staff assembled. Today is and should be all about recognizing you and your achievements. Now your family and friends in the stands may wonder how bad could it have been? The weather here is pretty nice. Other than a ridiculous lack of air conditioning, it seems pretty cool. People are very polite. To give you a window into what these students went through, they gave the Teaching Award to their data analytics and modeling professor. [LAUGHTER] I've been given three minutes to speak to you. This is going to be very hard for a faculty member to adhere to. But I wanted to use that time to open up that window just a little bit wider so that your friends and faculty can appreciate a bit what you've been through. Two years ago you made the bold decision to pursue an MBA at Johnson. For some of you, it was one year ago. Many of you left a perfectly good paying job in order to do so. You have done many things during this time. You have survived the core. Now, anyone who hasn't gone through it, cannot truly appreciate what those three little words mean-- you survived the core. You successfully completed nearly 7,000 courses collectively, countless quizzes, cases, exams, and a few understanding checkups. You led and served the 80 student groups. You supported the Class of 2019 as they progressed along their own journey toward graduation by serving as their tutors, their teaching assistants, and their friends. You laid a critical foundation for the success of the incoming Class of 2020 through your invaluable support of Destination Johnson serving as hosts and Johnson ambassadors. You raised well over $150,000 for charity and important causes. And don't forget the recruiting interviews, the fly outs, the site visits, the pressure. You did that. You did all of those incredible things. So if, over the last two years, friends and family noticed that you seem tired or were slower to respond to email, didn't call as often, or forgot a birthday or two, now they know. Things in Ithaca got real. But, of course, it wasn't all work. You also built bonds and friendships that you will have for the rest of your lives. You found interesting social venues in Ithaca and made them your own. Some of you got married. Some of you had babies. As a father of three, I don't know how you did that. But you did and you are amazing. I contemplated sharing some last advice with you. I mentioned I was a father of three, of course, so this is easy for me. It would be advice like be strong and fair leaders, because the world needs that. Look out for the least among us. Seek out views that can expand your own. Bring your whole selves to everything you do. Recognize that there is more to people and things than what the data say about them. Embrace your intuition. And on this Memorial Day weekend, to be thankful and appreciate how truly lucky we all are. But I know you. And I know that you know these things already. Instead, I want to exhort you to do something that comes unnaturally. And that is to put aside any pressure and worries that you have, at least for a small period of time, and allow yourselves to reflect on all that you have done, and to do so with pride and a huge sense of accomplishment. On behalf of the rest of the faculty and staff at Cornell and our broader community of alumni, I want to say congratulations for everything you have done during your time at this institution. And we all look forward to seeing what you will do in the years to come. Thank you. [APPLAUSE] AMANDA ARCHILA: I am so humbled and honored to be here today to speak on behalf of my classmates in the two-year MBA Class of 2018. Although I do confess I'm also a little bit surprised that after everything we've been through together, a group of folks decided it was still a good idea to give me a microphone without any certainty of what I would say in a room of hundreds of people, so many thanks. When I decided to leave my job and go back to school, one of the key reasons I chose an MBA was because I thought, man, this is where the real power is. These are the future decision makers that can change how business is done, maybe for the worse, but hopefully for the better. During my two years at Johnson with that notion still in my head, I've also come to know the group of MBAs in this room as, well, people. Some of us pull all nighters to study for that accounting test. Some of us call our families to check in on them every day. Some of us are passionate about theater or politics or cryptocurrency-- good look with that-- and some of us, maybe all of us at some point, are really just hoping to make it through the day. But when I take a moment to look around, I am reminded of that power I knew would be here at Johnson. A colleague would casually mention that their summer internship project led to a fundamentally new way a multibillion dollar company looked at a problem. A team of classmates would work with a small family business in Latin America for just a few days and provide a recommendation that could change their future. A friend would stand up and say that's enough, sparking a desperately needed conversation among men about how women are treated in business and society. It's in those moments that I remember that we are not a group of just people, but a group of leaders with tremendous power and potential for impact. Now power is a complicated word. It can be inspiring or corrupting. We shy away from it when we talk about ourselves, BUT we have no problem pointing it out in others. If I was to make one recommendation today to the Johnson Class of 2018, I would say to embrace the word power and recognize the good and the bad that comes with seeking it out. Don't ever diminish the power you have to be successful for yourselves, your families, and your communities. You've worked hard for this. You've earned the right to achieve only great things from here on out. But by embracing our power, we also need to leverage it when needed. See, we're no longer just another student, an employee, a cog in the wheel. We will be seen by others as symbols of success and achievement. We will be looked to. We will be called upon. We will be emulated. And so each one of our actions matter. Whether we're ready for it or not, we will be seen as leaders. And as leaders, we may be imperfect, but we must be courageous. As MBAs, when we see institutional norms that are outdated or ineffective, we must push back. As friends and colleagues, when we see someone being mistreated or undermined, we must speak up. As members of the greater community, when some of our identities have made doors of power easier to open than for others, we must stand alongside each other to push those doors open together. Sometimes, using our power means putting it on the line to do the right thing. Will you be prepared to risk some of your own to stand up and say that we can do better? As the next generation of businessmen and women, we must push back. We must speak up. And we must stand alongside one another to lead with courage. Paul Polman, the CEO of Unilever, spoke on campus earlier this year. And in his conversation about leading the way in sustainability in business, he said that the cost of not acting was increasingly becoming higher than the cost of taking action. And it reminded me of one of my greatest learnings as a Johnson Leadership Fellow that in times of difficult decisions, when we are often tempted to give up, one of the most important questions we can ask ourselves is what is the risk of doing nothing? Because we cannot forget that as leaders we will be looked to, we will be called upon, we will be emulated. And if we do nothing, nothing will be done. We have no excuse to stand by. There is no time to wait and hope that things eventually change for the better. We must embrace the power we have and act. As members of this unique Johnson community, it is our job and our responsibility to hold our organizations, our institutions, and even our soon to be alma mater accountable, to hold ourselves to a higher standard as leaders, and to hold each other up along the way. Because when we do, we will be looked to, we will be called upon. We will be emulated. And that will be a very powerful thing. Congratulations to the incredible, formidable Class of 2018. [APPLAUSE] INGRID JENSEN: Thank you so much to our inspiring students speakers. And congratulations to Professor Schmidt. We will now proceed with the individual recognition of graduates. 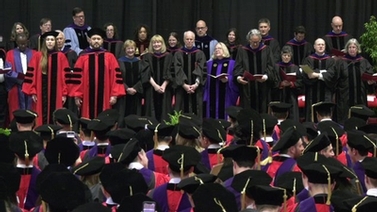 We will begin with the hooding of the doctoral candidates. Associate Dean Andrew Karolyi will perform the hooding. And Dean Nelson will congratulate the doctoral candidates. Please join me in recognizing the achievements of our PhDs and wish them continued success in their academic careers. [APPLAUSE] BARBARA MINK: [READING NAMES] INGRID JENSEN: As Barbara Mink reads that MBA graduate names and the MPS graduate names, she will highlight those students who are graduating with distinction, which is the top 10% of the class, as well as those students who are graduating with dual degrees. The MBA candidates will be recognized by program in the following order-- the two-year program, the one-year Ithaca program, the Johnson Cornell Tech program. And then, they will be followed by the MPS students in accounting. Thank you. BARBARA MINK: [READING NAMES] INGRID JENSEN: Congratulations to each and every one of you. [APPLAUSE] You have achieved so much. And I hope that you cherish every moment of this very special weekend. Collectively, you have had a tremendous impact. We will remember you. And we look forward to welcoming you back to Cornell. [APPLAUSE] Before we conclude today's ceremony, please join me in thanking the many friends and family who have joined us here today. Without your support, these graduates would not be sitting here today. Many of you have come a great distance to join us. And we are truly touched, and grateful, and honor you, and thank you. [APPLAUSE] I also hope that you will all join me in thanking the many staff who give up their Memorial Day weekend to organize the events of yesterday, today, and tomorrow. They are so very proud of you all. I would like to remind our graduates and the families and friends of the remaining events of the weekend. Immediately after our ceremony, we hope that you will all join us at Sage Hall where we will have food and refreshments and the Sage Dyson Atrium, the adjacent tent that is in the parking lot, and in the Atrium Cafe and Ramin Parlor. Tomorrow is a busy day when you officially graduate as the class of 2018 from Cornell University. For the university ceremony, which we encourage all of you to attend, please line up in the Arts Quad by 9:15. Family and friends should also be seated in the stadium at that time. The procession begins promptly at 10:00 AM. And the ceremonies begin at 11:00. Finally, before we adjourn, please stand and join us in the singing of the Cornell alma mater. The words are on the back of your program. [MUSIC - "FAR ABOVE CAYUGA'S WATERS"] (SINGING) Far above Cayuga's waters, with its waves of blue, stands our noble alma mater, glorious to view. Lift the chorus, speed it onward, loud her praises tell. Hail to thee, our alma mater, hail, all hail, Cornell. Far above the busy humming of the bustling town. Reared against the arch of heaven, looks she proudly down. Lift the chorus, speed it onward, loud her praises tell. Hail to thee, our alma mater, hail, all hail, Cornell. [APPLAUSE] INGRID JENSEN: Congratulations to the Class of 2018. Please remain standing during the faculty recessional. [MUSIC - "STRIKE UP A SONG"] (SINGING) Strike up a song to Cornell and let the swelling chorus rise before us. Strike up a song to Cornell and set the campus ringing with our singing. Fill the glasses with a song and drink the magic music spell. We will sound the joy of life intense in a rousing toast to Cornell. Strike up a song to Cornell and let the swelling chorus rise before us. Strike up a song to Cornell and set the campus ringing with our singing. Fill the glasses with a song and drink the magic music spell. We will sound the joy of life intense in a rousing toast to Cornell. Strike up a song to Cornell. Oh, let us strike up a song to Cornell. Strike up a song to Cornell. [APPLAUSE] [MUSIC] (SINGING) Onward, Cornell, to the top where you belong. Yours is the glory history has made in song. March with your classmates through the fights this honored day. We're proud to be Cornellians. We're behind you come what may. March on, Cornell, while your sons sing out this song. Over the top, we lead to glory. Alma mater must stand strong. March on, Cornell. Every star above Cayuga's waters will cheer our hearts to victory. March on, Cornell. March on, Cornell. While your sons sing out this song. Over the top, we lead to glory. Alma mater must stand strong. March on, Cornell. Every star above Cayuga's waters will cheer our hearts to victory. March on, Cornell. The Samuel Curtis Johnson Graduate School of Management honored its PhD, Residential and Cornell Tech MBA, and MPS in Management-Accounting graduates on May 26, 2018.